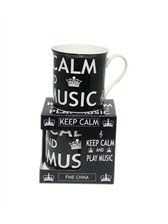 With a strong black colour and the classic Keep Calm design, this Mug would be a fantastic gift for any musician or lover of music. This Mug will always remind you to Keep Calm and Play Music. Express your musicality and individuality with this great-looking Mug that will remind you not to get the blues. With a strong black colour and the classic Keep Calm design, this Mug would be a fantastic gift for any musician or lover of music, to make sure that they always remain calm and drink a nice hot drink while playing some quality music.